This was a fantastic assignment and a great gig: a friend, who’s a successful screenwriter and owns a really great house in Santa Monica Canyon, contacted me with an idea. 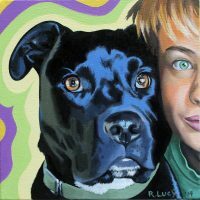 She and her husband and family are major dog lovers – and she asked me to paint their family’s dogs, past and present: ALL FIVE OF THEM! She really liked my colorful, abstract backgrounds and, while I was out in LA, I visited the house and took pictures of the room and got samples of the wall colors. 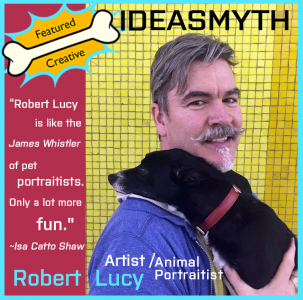 I loved this challenge—creating a unified collection of portraits and, especially, creating a wall to honor all the beloved animals in our lives.